TURTLE BAY RESORT is the only resort on the beautiful North Shore of Oahu, home to some of the greatest surfing in the world. For those looking for a change of pace from Honolulu’s fast-paced Waikiki Beach, it makes a perfect getaway and offers a great number of amenities. I arrived at about 4 p.m. the day before my round, checked into my lovely ocean-view room and toured the property to get the lay of the land. Down by the beach guests were enjoying a beautiful day of sun and surf in the property’s protected cove. I settled in for an early dinner at Roy’s Beach House with a delicious mai tai and some yummy sushi. But we are here to talk about golf. 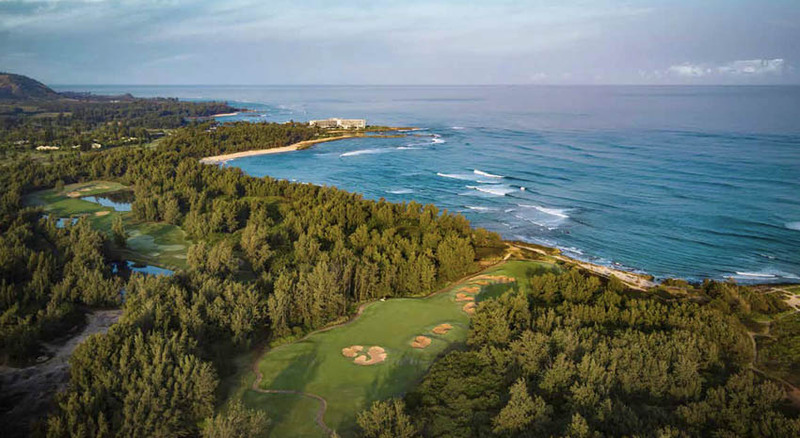 The beauty of Turtle Bay is you can choose from two courses: the Fazio, built in the 1970s and running along the coast, and the Palmer, which many feel is the best-designed course on Oahu. Arnold Palmer and Ed Seay designed the Palmer Course, opened in 1992. 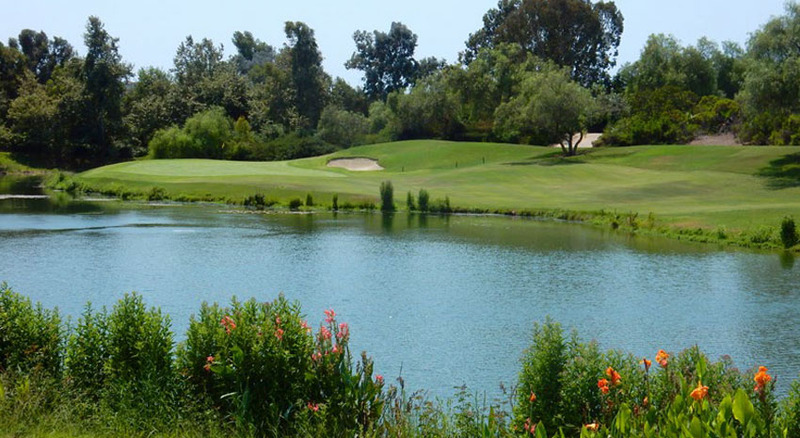 It makes its way, and often changes its look, from wetlands to woodlands to coastal as you play 18 holes. Players meet the ocean at the Palmer’s signature par-4 17th hole. The course sprawls over 180 acres, with a little housing development through the Punaho’olapa Marsh; you will see many native birds. The drive to the first tee from the clubhouse is in itself a relaxing nature preserve tour. I played the Palmer on a Wednesday morning that started off with torrential downpours. I put on my golf shoes, knowing this was my only time to play. As luck would have it, the rain eventually subsided to a glorious day. I teed up with a traveler from Dallas named Bruce who was also staying at the resort. I was taking a few pictures, so Bruce teed up first and swung away, sending his ball to the far right and out of bounds into the driving rain. Even Turtle Bay’s website warns of this right side. He teed up a second, which went left and a little shorter than desired but in play. The hole is a Palmer original dogleg right with a banyan tree on the right side of the hole. You either need to go over the banyan or carve a shot so it fades from left to right. I slammed my shot without a practice, probably one of my best drives of the day, landing in the center of the fairway. From there I miss-hit a chip shot, but it still landed on the green well within birdie range. Unfortunately, I missed the putt but carded a par for the first hole out of the gate. Hole 3 is a long par 5 with water on the right that I am sure takes a lot of visitors’ balls. Using my rental set, which included a nice Titleist 917 driver and wood set, I secured a decent drive to the right side of the fairway, staying out of harm’s way: the long pond on the left. Bruce had a series of mishaps, donating several balls to the water gods. From here, I got some additional distance with the Titleist 917 F2 3-wood and creamed a ball straight down the fairway, coming up short of the large trap on the right about 100 yards from the green. I was a bit concerned, as the Titleist blades were a little out of my league of play. I guess the pro thought I was a better golfer, and it took some time to get used to these irons. Fortunately, I hit a 54-degree wedge squarely on the green and secured a two-putt for par. From the tee box both Bruce and I selected a little less club, as we were warned about the water in front of the green. We were not sure our tee shots remained in play, but when we continued forward we saw we were both about 90 yards from the green. Bruce showed me up, shooting a lovely chip high and to the green. My shot shanked left and into the water. This is one of the most beautifully designed holes, and I look forward to the opportunity to try making par or birdie again! 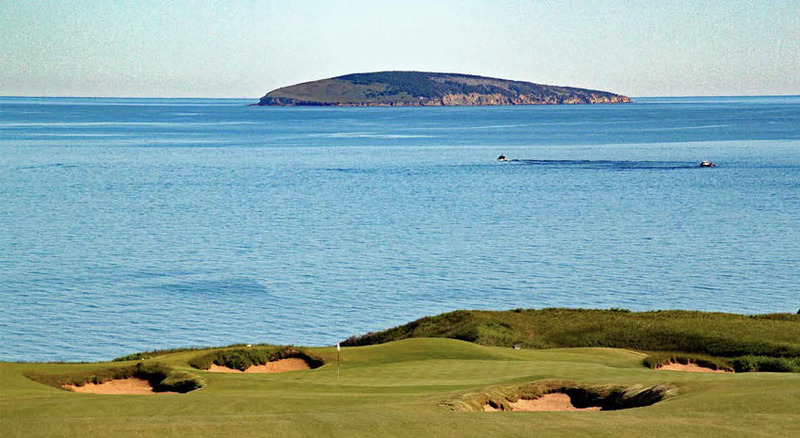 The Palmer Course really does not offer views along the ocean, and Hole 17 is the only time you can glimpse a spectacular beach and cliff view. This is from the back of the green, and you have to walk a few yards for the best view. But first things first: My drive off the tee box was far from stellar, coming up short but in the center. Nine bunkers dot this hole, favoring the right all the way to the green. I was safe and on the fairway but still far from the green with a gentle breeze in my face. 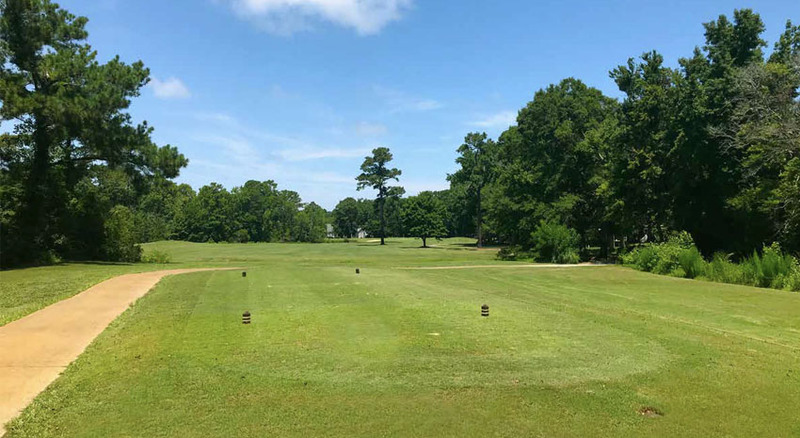 I selected the 21-degree utility wood and made a perfect connection, flying high and just on the front edge of the slightly elevated green. As Bruce struggled up, ticking off many of the bunkers on his way, I went ahead for a selfie of the view. Two putts secured a lucky par for me. A truly lovely finishing hole. 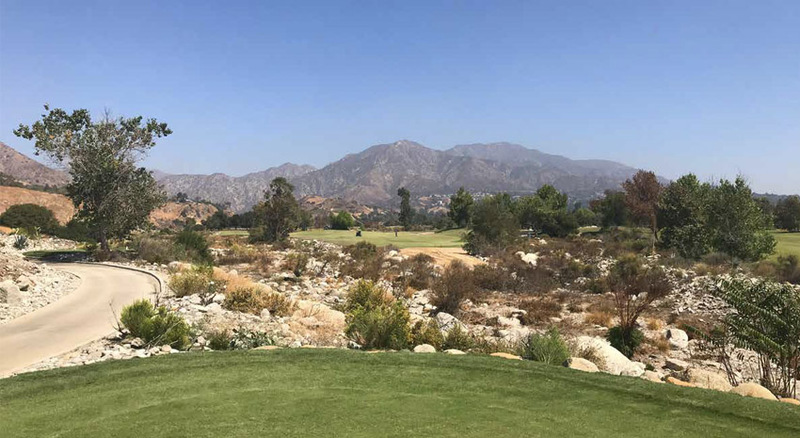 We caught up to the group in front of us, the first we had seen the entire round — we played 18 holes in less than three hours, spectacular in my book. From the tee box, it is a semi-blind shot down the fairway. The hole carries straight down and then, for your approach, turns right over the pond to the green. A smaller pond on the left can also come into play from the tee box. My drive was the second-best tee shot of the day, landing in the center of the fairway in position “A.” My next shot made me think about placement, as I was sure many shots from here ended up in the water. I figured I should go for it and took aim at a scrubby tree farther down the fairway and just before the two traps in front of the green. This was also just beyond the water. I hit a near-perfect shot (I took a picture of the woods, as I might buy them!) and thought I overcooked the shot and would nestle next to the tree, but luckily I was just short, making for an easy chip to the green and a two-putt. Bruce and I shook hands; and although he had a struggle, we both enjoyed our game. I returned to the friendly clubhouse and ordered an early lunch of grilled ahi tuna and a Caesar salad. I played so quickly I did not have to rush from the resort for my afternoon appointment in Honolulu.